That’s right. Me. Up there. That was how I felt upon finishing this mind f… er…. delightfully convoluted story. HOLY MOLY… I got it. No I didn’t. But I GET it… now. And yet I totally didn’t. But I did. But I wasn’t sure if it was me? Or her? Or had my mind just… cracked after all of that? I don’t even care, ’cause IT. WAS. AWESOME!! Jackie: Me too me too!!! Jill: I finished Sunday afternoon and I still can’t describe what I read or how I feel about it. That Tarryn Fisher sure knows how to make us think we’re crazy. But OMG, going back over it… it makes SO much sense. It does. And now… knowing… more things, I can’t stop thinking about it. Backtracking. Re-living. Re-visualizing. How? When? Where? Why? Oh. No. I KNOW why. JenC: OMGGGG. 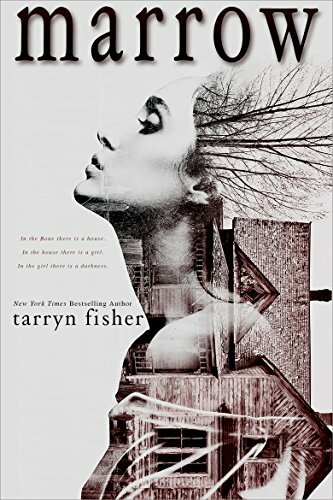 I’ve been reading Marrow for about half an hour now and oh my godddd, I can already tell: a) that Tarryn has done it again and b) this is a 5 star (and probably fave book of 2015). Maryse: I’m loving it too… dark but so meaningful. Maryse: I’m at 30% too…. am sitting down and ready for the long haul. So far though it’s PURE Tarryn Fisher. Amy: I’m at 60% of Marrow and I’m going to sit down shortly and read the rest of it straight through ’til I’m finished. It has me pretty twisted up right now in the most delicious way! Elizabeth: Loving marrow so far! very powerful. You feel every word she writes. Clever lady, that Tarryn Fisher. Weaving us in and out of a nightmare. A few nightmares in fact. Tripping us right into a few surprises that totally threw me for a loop. Suddenly I was sure everything I had been thinking or knowing, up to that point, was WRONG. WRONG WRONG WRONG because, come on… *that* reveal? And the circumstances where the reveal was… revealed? GAH!!!! What was I to believe? Who? How? What? Where? Yes… it’s one of those. But I thought… ? Wasn’t he…? She…? WHAT?!!! What about that… ? Never mind. I’ll let you go through your own erratic through processes, yourself. Maryse: oooooh it’s a series!!!! Supposedly the books eventually “tie in” together… I can’t wait to see how. Cheryl: MARROW, whaaat?! I’m confused, is this a continuation of Mud Vein? How?? :0 Maryse, “it’s a series?” Dear God if it is anything like Mud Vein; you know with Tarryn Fisher it’s going to be [email protected]%ked up story!!! Ugh!! I see drinking in the near future for me today. Please just let me know if it ends in a cliffhanger! Amy: Maryse, let’s see if I can keep from being spoilery here…pink Zippo was a sort of trigger for her in Mud Vein and there were pink Zippos at that house, remember? I love Tarryn Fisher’s writing style. LOVE it. She can make things dark and dismal without being depressing. I’m staying up tonight as late as I need to so I can finish Marrow ’cause I’m loving this book! Cheryl: I was wondering about the Pink Zippo too. Although still don’t quite remember that detail. Amy: if any – ties Marrow has to Mud Vein other than it being another psy-thriller sort of story, and that little message from TF is kinda cryptic…at least to me it is. I’m only about halfway through it though … so we’ll see what happens. All I can say is this one has some pretty dark elements to it…and I’m loving it! But no matter what, let go and enjoy the ride because it takes you through… about 4 different modes (and moods) as the story builds, fluctuates, and presents itself in it’s warped (and yet logical) reality. Because that is what a lot of reality is, isn’t it? Not all is fair in the world, and certain people process and handle things differently than the “norm”. …we move into mood #2 when she grows up into someone pretty wonderful. Finally finding herself, her independence, a few friends and an almost hopeful outlook on life. Caring for others, compassionate, and freer. Despite her desolate start, she’s not completely broken. And she’s hoping to help those that might be. I nod , the words caught in my throat, sticky with emotion. That’s the best deal life has ever offered me. But things (mood #3) change, as her compassion and love for others grows into an outright need to protect, and force balance. A calm fury. She becomes a vigilante, of sorts. I’m not proud. I’m not anything. An eye for an eye, I tell myself. A beating for a beating. I’ll let you discover mood #4 (and maybe there’s even a mood #5) on your own. Lots of personal apprehension, while you battle with yourself over the rights and wrongs of the world and how they should be dealt with. You’ll both cheer her on, and cringe. Stress. Knowing something big is about to happen. And all the while… your mind feels like it’s cracking. Because… you know. Things. Like the very THINGS that tie this story to Mud Vein. And now I feel a little… perplexed. Almost betrayed by my own certainty… ’cause what I thought I should *think* and thought… was maybe… not quite right? GAH! I dunno. Kind of. *sigh* I know. This review is NOT helping you is it? Jean: Just finished Marrow…… can barely process! My mind is in jumbles! OK, I need to evaluate…. Maryse, I need your review like right now! I know you will be able to help sort out the “craziness” for me!! Amy: Finished Marrow. Yeah, no words right now. I gotta digest this. Amy: Cheryl, if you read Mud Vein and liked it then you should give Marrow a try. Nothing to be scared of…there is just some stuff in it that I’m still trying to process. But I loved it. So different and soooo what I was looking for. Yep Amy and Jean… right there with you. I was a mess in the end of this one, but I think I got it. We need a spoiler forum to release this one properly. For all of you getting ready to read it. Don’t let our perplexed states scare you off. That should make you even MORE excited!! It was fantastic. Left me sitting there staring …. I love that. It’s just so exciting to finish a book on a high. So… just go with it. It all comes together, and yet will still leave you contemplating and second guessing yourself… and her, in the end. But I now feel very certain as to what this one was about and why, and I LOVE IT EVEN MORE!!! It’s the best thing anyone has ever said to me. The best advice. *conspiratorial grin* That quote right there says SO much. P.P.P.S. Thank you to the author for sending me this fantastic book! I knew what I was in for, and I couldn’t wait for the personal shake up! I’m half way through! My heart is heavy and beating fast wondering what is going to happen! I can’t wait to order the paperback! Such a great cover!! Love your review and when you read Marrow you know exactly what you mean, your sailing along , it’s powerful and then “Bam” your rethinking what you thought you knew , questioning yourself,going back over the details . I’m thinking , I am going to have to re read !! It’s not a book you soon forget ,even though your not sure what you know :/ lol I loved it and it’s a beautiful cover !! Katie, come back and let us know what you think. 😉 Tee hee! And yes, a spoiler forum would be GREAT ’cause what I thought after finishing it the other day has changed probably three times over since then, and I would love to get other ladies’ thoughts on “spoilery” stuff! LOL!! I thought mine was sort of… nonsensical blabber. You want to talk about mind-f*#ery? Tessa’s “Indebted” series is messing with me. I hate it (and love it) when I have no clue what is going on. None. I can’t even begin to guess. I keep asking myself why are they doing this to her? There better be a good explanation! Great review! You made total sense…to me anyway! I agree with Amy, I would have never been able to put it in words! That last quote you posted….. yeah, now I’m thinking about it more! And now MichelleS has us all squirrelly with Indebted! Maryse- I just finished and I’m confused, is that what she wanted??!! I have to process it all. I just finished reading it just now and I must say, it was a dark rollercoaster ride. I just want to ask something though as I’m really confused right now. But first, to all of you who haven’t read it yet, please don’t read my question because it contains spoilers. Okay, so my question is, does *spoiler* really exist? I was so confused at the part where Margo is seeing the psychiatrist and the latter told her that *spoiler*. So everything had *spoiler*? Gosh. I have a million other questions but this is easily the first of them. I’m really confused. So *spoiler* was totally *spoiler*? and there are no such thing that he was *spoiler*? Great review.. Ugh, I just finished reading Marrow… Somebody tell me what we are all trying so desperately to figure out… #mindf%$&ed.. EEeekkk.